Summerhill Pyramid Winery is an unforgettable wedding venue. As they state on their website they have a fantastic ceremony site, a large reception venue to host all of your guests and wonderful wedding photo locations. It's placement on the shores of Lake Okanagan give it an excellent view of the surrounding landscape while at the same time offering beautiful vineyards with which we can frame our brides and grooms among the greenery and budding grapes. One might say they can host an organic wedding at Summerhill Winery. As Summerhill Pyramid Winery Wedding Photographers we scour the property looking for the best angles to capture our bride and groom on the day of their wedding. Throughout the day we are given the privilege of capturing the bridal party, the wedding dress, the bouquet, DJ, details, maid of honour and best man and we are always looking for the best and most flattering light with which to illuminate our subjects. 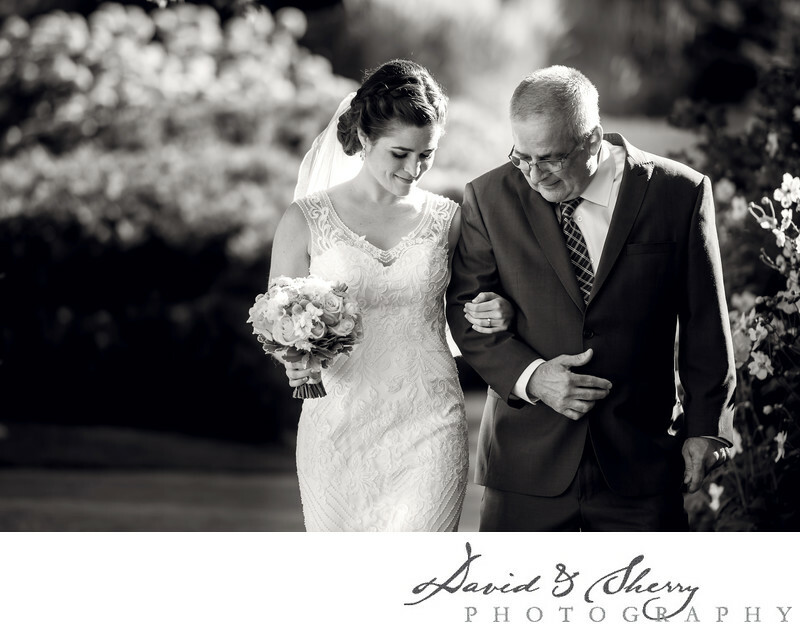 In this particular photo we are capturing the natural emotion and reaction of dad and daughter walking down the aisle on the way to her nuptials. I love the care on the father's face as he doesn't want to step on her dress while at the same time holding back the emotions of the day. It is our duty to grab on film the real moments in a photojournalistic way and be out of the way in our photography while at the same time delivering images that feel like you are part of the event. The care of the staff at Summerhill is fantastic and they are certain to take care of your every need. Summerhill Pyramid Winery is located in Kelowna, B.C. Location: 4870 Chute Lake Rd, Kelowna, BC V1W 4M3.